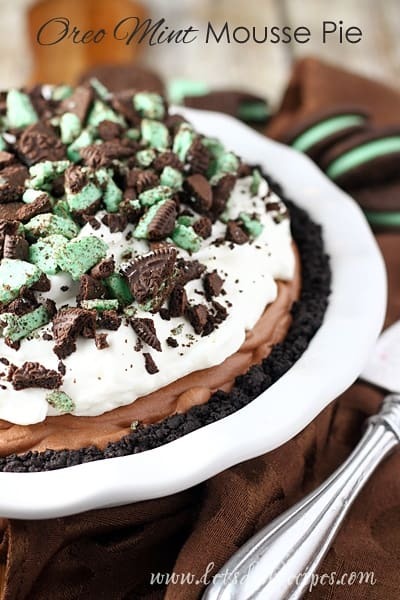 OREO MINT MOUSSE CHOCOLATE PIE — Minty chocolate filling in a chocolate crumb crust, topped with whipped cream and crushed Mint OREO cookies come together in this chocolate pie. 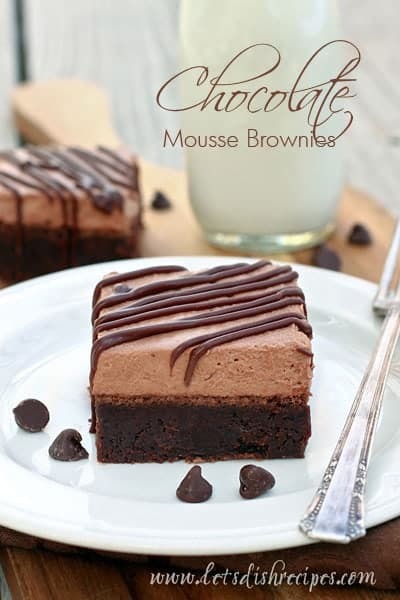 Do you love chocolate and mint? I’m a huge fan of any dessert that combines those two delicious flavors, so this Oreo Mint Mousse Chocolate Pie was right up my alley! 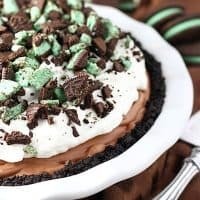 With a chocolate crumb crust, a minty chocolate mousse filling, fresh whipped cream and a Mint OREO garnish, this chocolate pie is sure to be a hit with chocolate and mint lovers everywhere! This luscious chocolate pie will be well-received any time of year, but with the hint of green in the cookies, it’s especially appropriate for St. Patrick’s Day. I made my chocolate crust with Nestle’s Famous Chocolate Wafers, but you could also use OREO cookies, or even buy a pre-made chocolate crust. And you want to make sure to use mint extract, not peppermint extract. They’re slightly different–your going for the flavor of a Thin Mint Girl Scout Cookie, not a holiday candy cane. One thing is for certain, this pie is impressive! When my boys saw it in the refrigerator, they exclaimed, “Wow! When do we get to eat that!” Not soon enough, as far as they were concerned. The chocolate mousse filling for this pie is adapted from my favorite easy chocolate mousse recipe. It’s sets up and slices beautifully, and would work just as well without the mint extract. If you ever need an amazing, no-bake chocolate pie filling, I highly recommend this one. This pie disappeared quickly at my house. I hope you love it as much as my family and I did! 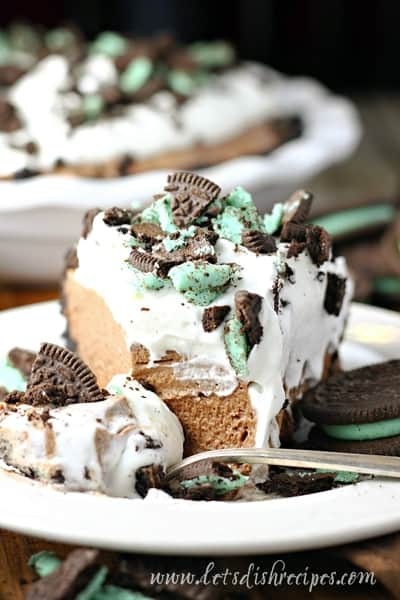 Be sure to save this Oreo Mint Mousse Chocolate Pie recipe to your favorite Pinterest board for later. Minty chocolate mousse filling in a chocolate crumb crust, topped with whipped cream and crushed Mint OREO cookies. Preheat oven to 350 degrees. Combine chocolate cookie crumbs and melted butter. Press mixture into a 9-inch pie pan. Bake for 7-10 minutes. Cool completely. In a medium saucepan, combine marshmallows and milk over medium heat. Cook, stirring constantly, until melted and smooth. 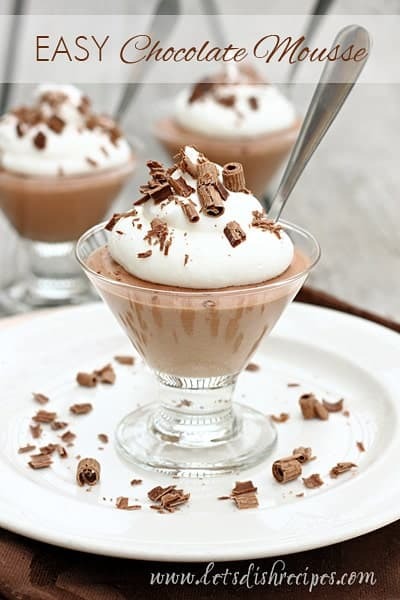 Remove from heat and stir in chopped chocolate and mint extract until smooth; set aside. With an electric mixer, beat cream and sugar until stiff peaks form. Set aside 2 1/2 cups of whipped cream. Fold 1/4 of the remaining whipped cream into the chocolate mixture (it will still be warm). Then fold the chocolate mixture back into the remaining whipped cream. Spread the chocolate mint filling into the cooled crust. Refrigerate for 30 minutes. Top the pie with the reserved whipped cream. Garnish with chopped Mint OREOs. Refrigerate for at least hours before serving.